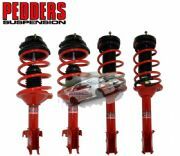 As their name, Pedders Ezi-Fit, suggests these are a complete kit, supplied ready to fit replacing your old, tired WRX or STi suspension. Careful matching of the spring rates, bump stops and valving within the struts ensure your SportsRyder springs will work in perfect harmony with your SportsRyder struts. By using the 'Buy Now' button below you can safely order your Pedders Ezi-Fit kit online and receive FREE STANDARD UK DELIVERY until the end of November 2014. Free UK standard delivery is open to the majority of UK mainland destinations however our free UK delivery offer does not include those delivery addresses to any UK Highland, UK Island or UK offshore postal codes. Should you reside, or require delivery to any of these UK Highland, UK Island or UK offshore destinations please contact us prior to placing your order as there will be an additional charge payable for delivery. Please click here for our geometry (4 wheel alignment) services. Mocom Racing offer corner weighting and 4 wheel alignment (geometry) for complete chassis optimisation of your road, track, drift, rally or race car for Essex, Suffolk, Cambridgeshire and the surrounding counties. All our corner weighting and geometry services are conducted from our fully equipped workshop on the Essex & Suffolk border, just a 30 minute drive from Stansted Airport, 10 minutes from Braintree Freeport and 5 minutes from Sudbury.